So you’ve got a performance coming up, or you’ve set yourself a goal or a deadline in your chosen field. But how do you know it’s achievable, and how are you going to ensure that you do as well as you can? Last week I talked about one of my favourite quotes from FM Alexander’s books: “confidence is born of success, not of failure.” It’s a quote that’s worth unpacking, because it can teach us a lot about how to organise our activities, goals and performances. Following on from my favourite quote, FM reminds the reader that confidence isn’t just a fuzzy feeling – it is based on a foundation of what he calls “satisfactory experiences.” And if we want those, we need to plan out not just the ‘scaffolding’ of the satisfactory experiences themselves, but also how we are going to ensure that each experience is satisfactory. So our task, then, is to construct for ourselves a confidence building success staircase that gets us comfortably from where we are to our chosen goal. Let’s start off by checking that you have a goal, and that you’ve been realistic about it. Don’t make your goal too scary to begin with. It needs to be a little bit scary, otherwise you’re just working within your comfort zone and not improving. On the other hand, if the goal terrifies you, you’ve gone too far. For example, if I chose to enter myself for a triathlon, I’d be pushing myself too far. I may love running and cycling, but I can’t swim and actually risk panic attacks if I get in the water (it’s a long story…). One of the best ways of feeling confident in a performance setting is to have done it many times before. But this isn’t always possible. For example, on Saturday I was fortunate to hear a talk by Dr Terry Clark of the Centre for Performance Science at the Royal College of Music. He remarked that even Conservatoire musicians might only appear in a very few actual concerts over the course of their degree. Thee likelihood of feeling anxious is greatly increased if you haven’t had much experience in a particular setting. So it makes sense to do your best to prepare yourself by making small interim goals intended to create a confidence-building success staircase. This way, even if you can’t do a trial performance under the full performance conditions, at least you’ll have done everything to make the step up to performance conditions as simple and straightforward as you can. 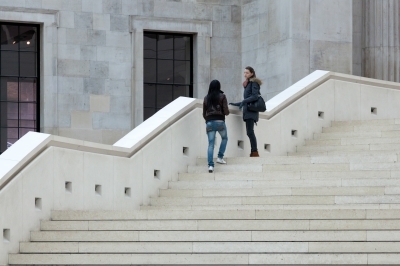 What might a step on the success staircase look like in practice? It depends on what you feel you need to practice. At the Royal College of Music, for example, students book the virtual reality performance space simulator in order to accustom themselves to the process of events immediately pre-performance; they even show up in evening dress! My recorder quintet have been known to enter the local Eisteddfod in order to play a tricky new piece under performance conditions but with a small and friendly audience. One of my students had his final year recital at 9am, and so worked at changing his practice schedule to accustom himself to performing at his peak earlier in the day. Can you create a set of steps that will build your confidence to get you to your goal (practice at a different time of day; organise a trial run in front of friends; organise a dry run in someone else’s house/small safe venue; do a dry run in your performance gear; etc)? After each step, evaluate what went well, and decide what aspects you need to address for the next step to be successful. You may even find you need to add in a step or two to address specific issues. Next Next post: Making mistakes in musical performance: should we aim for perfection?